I remember when my mom would make pot roast with carrots and potatoes in her slow cooker. I would come home from school and the house would be filled with the yummy smell. The dog must have hated those days, having to be around that smell and not be able to eat it. Slo Cooker..... not a crock pot! 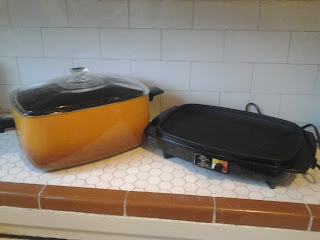 Her slow cooker was orange and ugly. I never much paid attention to it. Until just about a month ago we were talking an she stated if I found one like it she would like it. 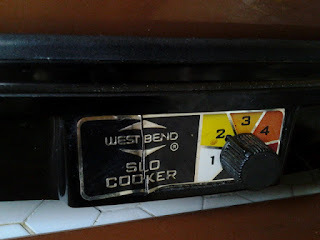 Hers broke and she preferred he slow cooker type, one that sets in the base, not in. Well I found one. For $5 in Palos Verdes. Exact color and everything and of course I had to try it out. But not with pot roast and carrots. I made sloppy lentils, like sloppy joes but vegan. Add all to crock pot or slow cooker. Stir. 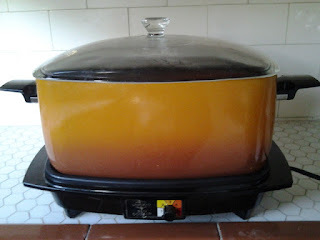 Cover and cook on Low (Mine was on 3) for 8 hours. Serve on buns. Now remember crock pots/slow cookers temps may vary from appliance to appliance.